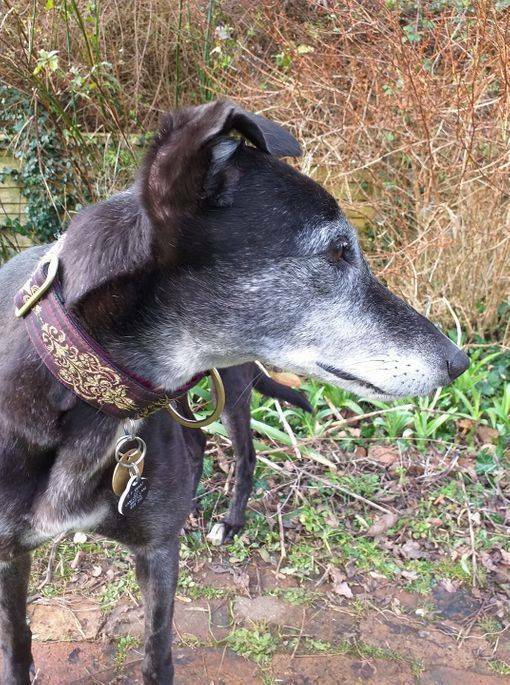 Hi, I'm Sally and I'm a slightly older greyhound girl, I was born on 9 May 2010. When I was younger I had 38 races up to 2014, winning quite a few of them. Then, in 2014, I had my first litter of puppies followed by another litter in 2016. In spite of my age, I'm full of fun and enjoying finding out about home life with my new foster brother Allen. I'm clean in the house and good on my lead. Us greyhounds make the most marvellous companion animals when we're given the chance, even though we've been brought up in kennels and have never seen household appliances, patio doors and dogs which aren't greyhounds! As you can see from my photo, I'm black with a grizzled face, but don't be put off by that, f you would like to meet me, please contact one of the humans to make an appointment, I'm so excited just thinking about it! Her gums have healed nicely after her dental (with 10 extractions!) and she coped really well with the anaesthetic. She is clean in the house and quiet overnight, sleeping downstairs. She loves her food, but is not pushy, in fact she often lies down, patiently watching me get it ready! She gets on great with foster DAWG Allen and they are really sweet and gentle when they play together! She could be an only dog as well. She is regularly left for 4-5 hours whilst I'm at work. Whilst she is quiet and calm in the house, she is very excited to be out and about! She is learning to walk nicely on the lead, but it's a work in progress! Sally is a lovely, gently affectionate girl, and she's ready for her forever home, is that you?